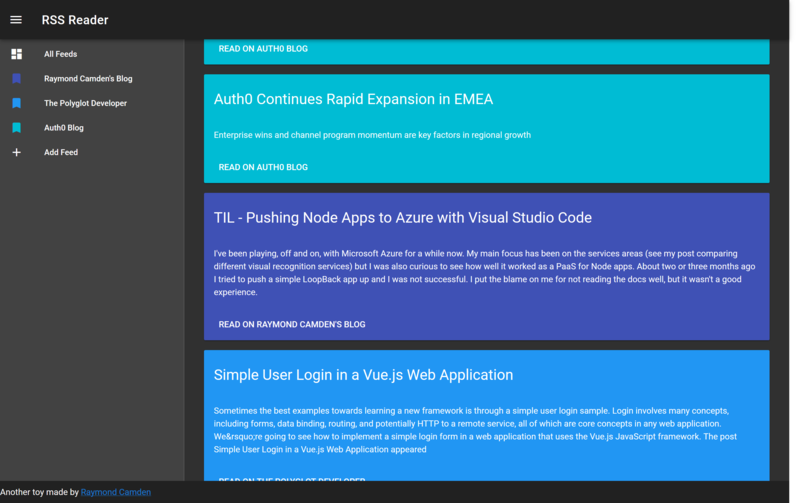 As I explore, learn, and most importantly, play with Vue.js, I've been building different types of apps as a way to get practice with and improve my use of it. 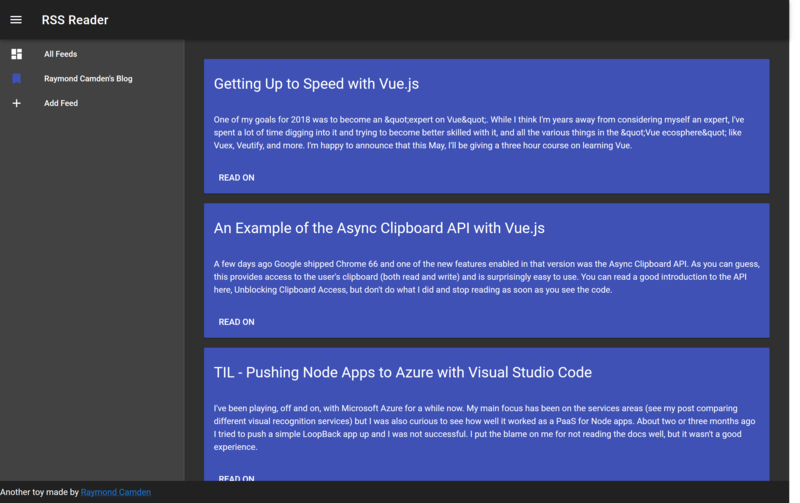 A few weeks ago, I was reading about the shut down of Digg's RSS Reader and while great alternatives exist, I thought it would be fun to build my own with Vue. In this article, I'm going to explain how I put it together and also what's wrong with it. I knew getting into this that I was going to make some compromises, so the plan is to follow up this version with a nicer one in a follow-up post. Let's start by looking at the app and explaining the various components. When opening the application, you're presented with some basic instructions and a prompt to add a new RSS feed. Notice the color. I set it up so that each feed would have a unique color, making it easier to tell one site's content from another. For example, here is how it looks with more feeds added. The panel on the left lets you filter by clicking on a feed. Unfortunately you can't delete a feed yet so, if you need to remove something, you'll need to open up your DevTools and edit the cached value. Let's go over the tech stack! First and foremost is the Vue library itself. I'm *not* using webpack for this application — just a simple script include with no build process. The UI is all Vuetify, a very nice material design framework that is easy to use. I'm still learning it, so you can be sure that my design could be better, though I'm really happy with how it looks now. Persistence is done via localStorage. I store the feed metadata retrieved from the RSS feed. This typically includes things like the name of the site, the main URL, and a description. I do not store feed items which means every time you load the site, I re-fetch items. The next version will keep items locally using IndexedDB. So, how do I load feed information? I could just make a network request to the URL, but most RSS feeds aren't making use of CORS which means the browser would be blocked from loading it. To get around this, I wrote a quick serverless function with Webtask. It handles both creating a CORS-friendly endpoint as well as parsing the feeds’ XML into friendly JSON. Now that I've covered the various parts of the application, let's start looking at the code! Let's start with the layout. 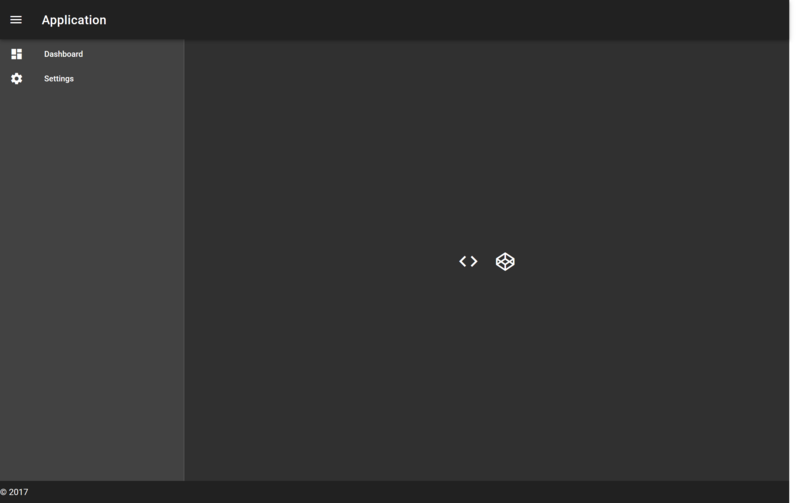 As I said, I'm using Vuetify for the UI. I started off using the dark sample layout. This is what creates the header, footer, and left column used for the menu. I used the card component for individual feed items. I'm not quite happy with the layout here. For example, I don't have publication dates rendered yet because I had trouble finding a nice way to render it. I decided to simply punt and wait till the next version, which we’ll **see in Part 2 of this series. 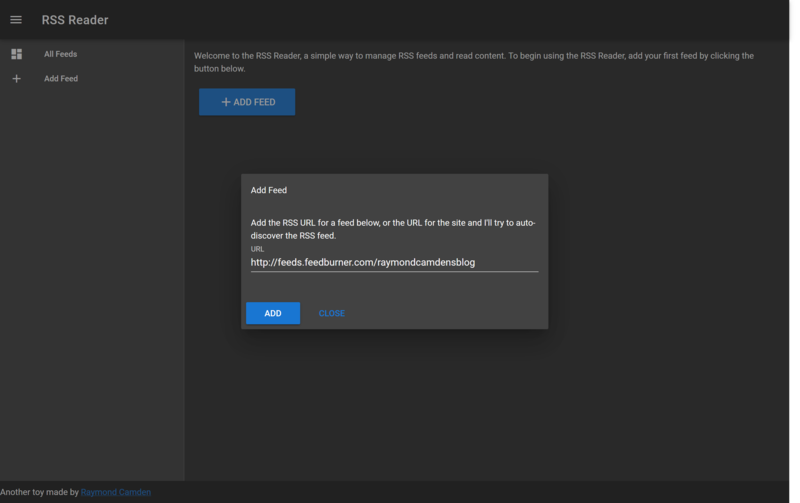 Welcome to the RSS Reader, a simple way to manage RSS feeds and read content. To begin using the RSS Reader, add your first feed by clicking the button below. Note the button for reading a feed item uses a target to open it up in a new tab. The restoreFeeds method handles checking LocalStorage for existing feeds. Note that this method handles assigning a color (which is a simple array) and then loading feed data. 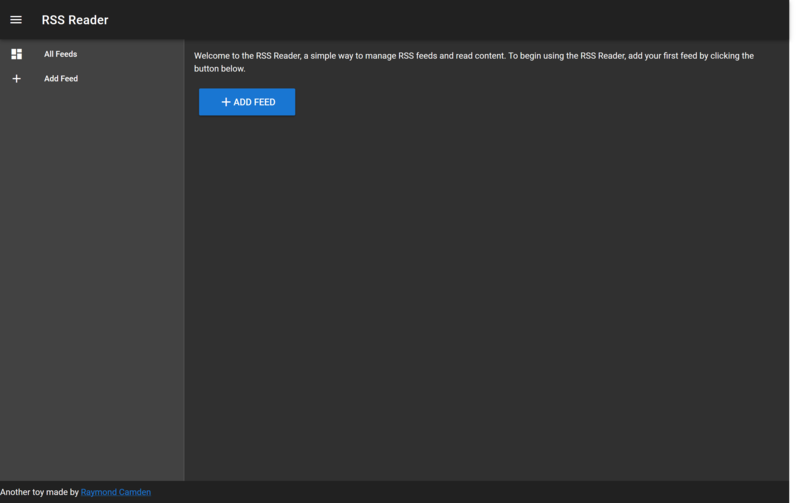 Speaking of that, how do I handle loading RSS information? Currently there are two times where this happens. First is when you initially add the feed and second when you reload the application and the feed was already defined. In both cases, I call one URL — the serverless task defined with Webtask. This task will return everything — the metadata about the feed and the items itself. I only care about the metadata on the *first* call and, in theory, I could have made the code a bit quicker by removing the metadata at the server side and strip that out but it didn't seem like it was worth the effort. All I'm doing here is wrapping the npm package rss-parser and that handles all the converting for me. The if statements you see in the beginning handle looking for the url parameter. When calling my webtask, I can either pass a query string variable or send it as part of a HTTP body. Either way, I simply use the rss-parser module and return the result. Looking at it now, I could gather my items from each feed instead of storing one global array, though I could address this later, if I want. I love that Vue gives me options for how to solve things like this. When I started this article, I explicitly thought *this* *is* a first draft. I've pointed out things here and there that I like and don’t like, but what exactly do I plan for the next version? I want to move all the data access into Vuex. Vuex is described as a "state management pattern + library" for Vue. If that doesn't make much sense to you, don't worry. I had no idea what it meant at first either. To me, Vuex provides a way to handle more complex data in an encapsulated manner. This becomes even more important as you start building more components that need to share data. Speaking of components, I should consider making "item" a proper Vue component. That's an easy win. I want to start storing feed items in IndexedDB so you'll get content the second you open the application. This will make the application much more performant and provide basic offline support. Of course, you can't read the full entries if you're offline, but at least *something* could be provided. ...and anything you suggest! Take a look at the code and feel free to make suggestions and point out mistakes!